Seattle - Corporate Jet Charters, Inc.
Seattle is a coastal seaport city and is the largest city in both the State of Washington and the Pacific Northwest region of North America. Downtown Seattle offers a unique fusion of outdoor and urban life. The city is surrounded by beautiful lakes and Mt. Rainier as a spectacular backdrop. Travelers have access to Tillicum Village, Argosy Cruises and many other spectacular attractions. Seattle’s Pike Place Market is a must see for any tourist. The market is home to a host of businesses including bakeries, specialty food stores, collectibles, jewelry, art and much more. Seattle Boeing Field, also known as King County International, is the typical choice for busy jet charter travelers due to its proximity to the business district of downtown Seattle. The airport serves small commercial passenger airlines, cargo carriers, private aircraft owners, helicopters, corporate jets, military, and other aircraft. It is also home to the Boeing Company’s 737 aircraft flight-test program, along with other Boeing operations. The Museum of Flight is also located there, with its wide variety of aircraft and exhibits showcasing aviation history. 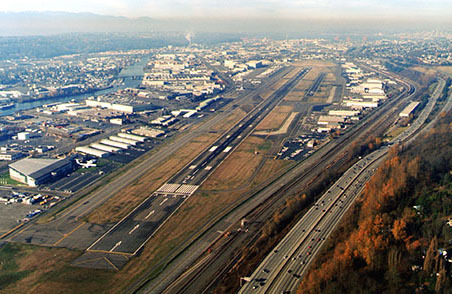 Boeing Field has two runways with the longest being ten thousand feet.